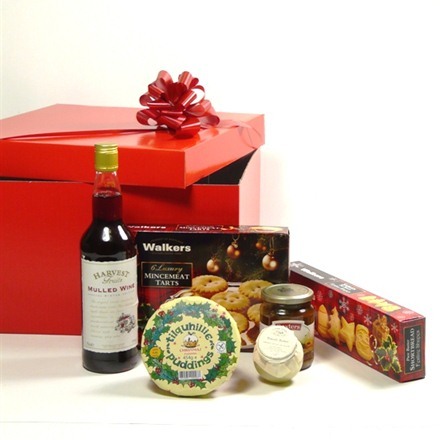 Here are our favourite Christmas hampers – all priced at less than £50. 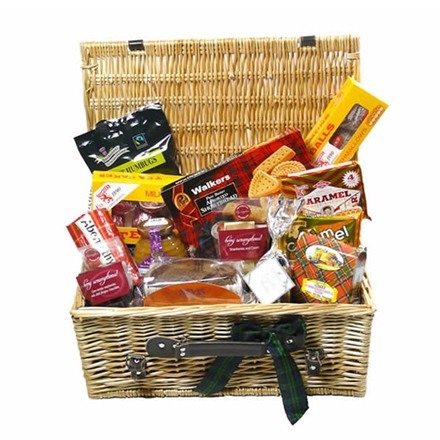 Take a look and order your festive Christmas hamper today. The Sweet Toothed Christmas Hamper is a scrumptious collection of fine chocolates, biscuits, wafers, cakes and sweets as well as delicious shortbread and luxury Scottish honey. Attractively arranged and sealed in an open willow basket with a hand tied bow and personalised gift card, it’s great for that special someone you know with an insatiable sweet tooth. All cheese lovers will appreciate the complimentary flavours of this vintage port with a full flavoured artisan cheese from the Mull of Kintyre. It is taste sensation only bettered by the wonderful decadence of Scottish raspberries nestling within rich dark chocolate. 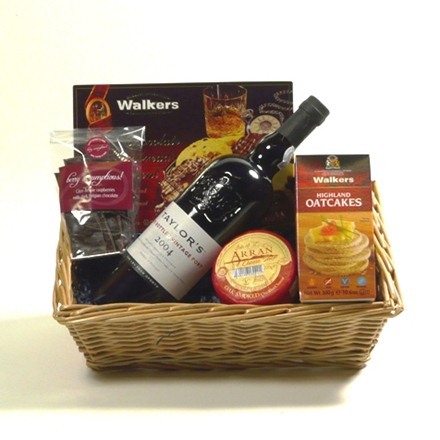 Presented in an open willow basket with a bow and personalised card, the Cheese and Port Gift Basket is a perfect gift for one of the men in your life who are never easy to buy for. You can’t go wrong with champagne – it must be the way the bubbles tickle your nose. Enjoy with sensational Scottish salmon served with sliced cucumber and lemon, or add eggs and orange juice to create a perfect festive Scottish breakfast. 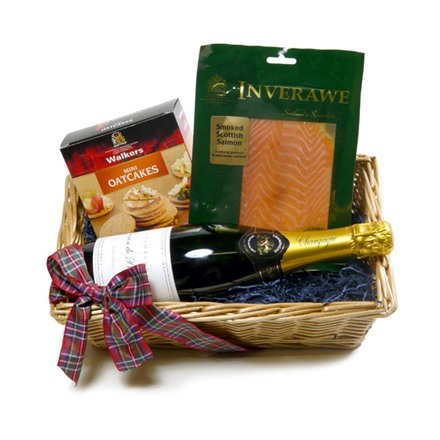 The Champagne and Salmon Gift Basket is perfect for your favourite foodie. The Gigha Christmas hamper is a beautifully presented gift box packed with lots of festive treats including mulled wine, spiced fruit chutney, Scottish Christmas pudding, mincemeat tarts and brandy butter. Perfect as a gift for a colleague, boss or neighbour, it has all you would wish for a merry Christmas. The festive red box looks great under the Christmas tree too. We can send any of these Christmas hampers overseas although we will substitute any alcohol for deliveries outside the UK/EU. Details of last shipping dates are available here. Next > Is Scottish salmon the food of love?